Manufacturer of a wide range of products which include poddar school shoes. 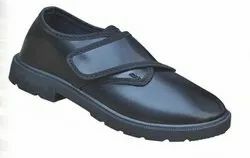 Our company is instrumental in offering premium quality School Shoes to our esteemed customers. These shoes are manufactured from best quality leather, which is sourced from well-known and trusted vendors. Owing to their flawless finish and durability, these school shoes are highly demanded in the market. Offered school shoes are available with us at affordable prices.